This data logger has four inputs, and records 0 to 32,000 counts per interval. It can be connected to third party sensors to record properties such as pressure, flow rates and footfall. It plugs directly into a network point and sends data via the LAN for immediate viewing in the Tinytag Explorer Connect software. The logger is supplied with: a PoE injector, an RJ45 shroud and four input leads. Alternatively you can buy our 2-pin connector plug to connect to your own sensor. 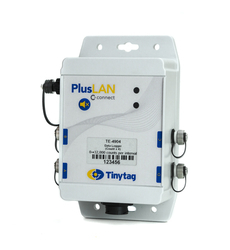 LAN loggers can be mixed and matched with Tinytag Plus Radio and Ultra Radio data loggers within an application to meet particular site layout and infrastructure requirements. See data sheet for restrictions on domestic use. Tinytag LAN loggers also operate as individual standalone devices without Connect functionality, sending their data from their location via a network point for viewing on a PC in the standard Tinytag Explorer software.